Bali lies in the Indian Ocean, north-west of Australia. It measures just 140 by 80 km (87 by 50 miles). There is diving all year round: between April and September is the dry season but the best time to go is possibly between September and November. April and May is the time to see Manta Rays, although at the Manta Point dive site you have a chance of seeing them year round. Mola mola, the oceanic sunfish and the largest bony fish in the ocean, are present all year, but the best time to see them is from August to October. For sharks go to Mimpang in Amuk Bay. There are a wide variety of dive sites, some suiting beginners and others with fierce currents and only for experienced divers. Highlights include Tulamben's awesome Liberty wreck, the reef manta rays of Nusa Penida and the fascinating macro marine life of Tulamben and Seraya Secrets. The video below, by Nick Hope of Bubble Vision, shows you what the diving is like around Bali. The footage covers the breadth of Bali's fascinating underwater world. It also helps you identify Bali's marine life as it showcases 158 underwater species and gives their common and scientific names- click the CC button under the video to see them. None of Bali's best dive sites are located in or near the the major tourist areas in the south. On route to the better dive sites you travel through some very pretty Balinese countryside, seeing rice terraces, coastline, rural villages and Bali's most revered volcano Mount Agung on your journeys: take your camera. Roads in Bali are not up to western standards, therefore it takes longer to get from A to B than it would "back home" if you simply look at the miles/kms involved. Bali has a hyperbaric chamber at Sanglah Hospital in Denpasar. See also our guide to things you need to know before your trip to Indonesia: visas, currency, tipping, etc. Our thanks to Annabel Thomas, director of AquaMarine Diving Bali, for the information she has provided, and to Nick Hope for his excellent videos. "I been diving in all parts of the world and Bali is one of the best in my book. 9 days 11 dives in three different sites. Highly recommended." Tulamben is a small village on the northeast coast of Bali. The diving here comprises a black sand slope with a 120 m shipwreck, coral gardens and a wall (all detailed below). The fist-sized black stones can make entry tricky when there are waves present. Being on the northeast coast the bay receives plankton-rich waters from a major ocean current moving from the Pacific to the Indian Ocean. Coupled with the fact that the three main dive sites provide totally different physical environments, this means that Tulamben contains a stunningly diverse underwater ecosystem. The stony beach becomes black sand in the shallows. The darkness of the sand together with the amount of plankton in the water accounts for the relatively low visibility (12-25 m). It does however provide a dramatic contrast, bringing out the colours of the corals, gorgonians, fish and other marine life. "We had a great time diving Tulamben and visiting Bali. The diving was very good, but I personally expected something more: maybe I had too many expectations because of what I'd seen in magazines and books. I mean, it is a very good site with easy-high level diving if you are interested mostly in critters (as me and my wife are) but, to me, it is not the same level as Bunaken or Lembeh strait. Apart from the diving, Bali is a great place to visit - full of natural beauties to see and cultural inputs to experience. The people are very, very polite and we really felt at home...I would recommend to dive in Batu Kelebit, five minutes by jukung boat from Tulamben beach. It is a very good dive and we saw at least 8 fat pygmy seahorses on a single gorgonian. " "I celebrated my 40th in Asia and part of the trip was a diving hols in Bali Sanur. We`did our initial test in Britian and completed the dives and the rest of the test in Bali. We had a really good instructor and he had all the patience and we dived in Tulamben on the last day where the American ship wreck was. I would really recommend it. It was all Padi certified. " "I did as many dives as my budget could tolerate, Tulamben wreck, good visibility and schooling Jack-fish. The second dive at Tulamben wall was also very nice, Nurse shark, Manta, and so many nudibranches. Gili Selang, Monkey reef, and Blue moon were also spectacular with all sorts of amazing corals. My dive-buddy`s were always germans, but I survived...!I want to thank the crew both in Amed Scuba Dive Center and C`est bon cafe for their friendliness and genuine hospitality, especially Nyoman who drove me home and picked me up to whatever my needs were. The best service and great friends, I had so much fun with you guys and I will be back! " 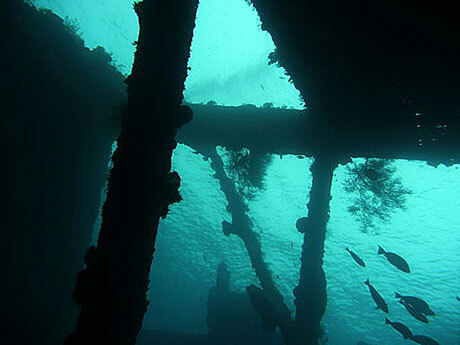 "Tulamben is famous with its USAT liberty wreck ship. You can see beautiful marine life there. " Currently rated the third best wreck dive in the world, the Liberty lies on a black sand slope almost parallel to the beach. It is just 30 metres from the shore. This dive site is suitable for all levels of qualification and experience. The wreck lies in depths from 9-30 m; the shallowest part of the wreck, where it touches the sand slope, is at 5-10 m. Depth along the middle of the wreck is 16-20 m. The lower edge of the wreck, i.e. furthest down the slope, is 20-28 m (at high tide). The wreck is 120 m long, it's pretty broken up (i.e. no penetration possible) but you can still see the guns, toilets, boilers, anchor chain, etc. It is a lovely dive site, possibly the world's easiest wreck dive. Also known as the USAT Liberty, USAT stands for United States Army Transport. Visibility is usually 18-25 m, lower when it has been raining. There is rarely a current present, at most it will be mild. During the 3 days before the full moon, there are usually waves. The air temp is 25-32 degrees, the water 26-28 degrees. The wreck is very popular with photographers as it is totally encrusted in anemone, gorgonians and corals. The black sand provides an excellent colour contrast for the incredible variety of marine life, which includes a huge school (literally 100s) of big-eyed trevally and over 400 other species of fish. All the fish are very tame (partly as a result of some guides feeding them, a rather un-environmentally-sound practice) from the goatfish and wrasse that nibble around your feet and fins during entry/exit to the unicorn fish and surgeonfish which make a beeline for your mask (and slightly alarming sight the first time you see them!) as you swim down towards the Wreck. You will see just about everything in any Indo-Pacific Reef Guide book if you dive here. From the minute anglerfish, neon nudibranches, ghost pipefish, shrimp/goby sets, through to garden eels and multi-coloured clouds of anthias and damsels and schools of sweetlips, batfish, fusiliers, butterfly fish. The variety is amazing. Then there are the invertebrates, the hard and soft corals, black corals, sponges with crinoids, sea fans, tunicates. If you dive early i.e. first divers on the wreck (only possible if you stay overnight) you may see a turtle if you are lucky. Early morning is the best time of day to dive the wreck. Night diving on the wreck is great especially during the full moon. You may see Spanish dancers, flashlight fish and phosphorescence. "The best spot so far I have ever done last 25 years in Diving experience is USAT Liberty Tulamben Bali. I am have been visiting this spot more than 50 times and still wanting to do it again. The 1st best time is 6 am to greet a bunch of bumbhead fish to go out find their food after spending the night sleep in USAT Liberty. And the 2nd best time is night dive, you can easily to watch them sleeping. The biggest number have ever seen was 90 bumbheads in this spot! What a dive! " "Clear vision and good position of the wreck for better way to see all the marine life over there." "Amazing ship wreck. Walk in from the beached explore the 120 metre long WW2 wreck. Lots of nice swim throughs. Highly recommended." "During my travel to Bali had enrolled at "Dive Concepts" diving school in Tulamban and learnt "Open Water Diving". One of my unforgettable images during the training dives was my first visual of the wreck ship "USAT Liberty".It was straight from a real life scene of the fictional film "Titanic" as shown in the movies.The sight of the anchor as we approached the ship and the sea-life around the wreck was amazing.No doubt this wreck site is within the top 3 dive sites in the World.Most importantly it is easily approachable from Tulamban beach and even a snorkeler could get a glimpse of this natural museum wreck..?" "A beautiful wreck, dive it from the shore..."
"Stunningly beautiful WWII ship wreck off east coast of Bali inhabited by huge amount of fish including 15-20 humphead parrotfish. " "Peleliu Express is a better dive than Liberty wreck ...I dove both earlier this year. " "World War 2 wreck dived from the shore. Huge schools of trevelly, bumpheads at dawn or night , giant trevelly,tuna and we saw a blacktip shark." In late 2012 a Dutch-built, 38 m long government patrol boat was scuttled just 25m from shore north of Tulamben Bay. You can dive both this and the Liberty USAT in one day. "Purpose sunk wreck at about 18 - 35 metres deep. No other divers on it. Small but peaceful and sitting upright. " Running along the middle section of Tulamben beach is a shallow reef of mainly table and fire corals interspersed with anemones as well as barrel and other sponges. The fish life, as with the drop-off and the wreck, is very diverse. It is here that you can see a surprising number of blue ribbon eels (the juveniles are black) and octopus, the variety of shrimp is surprising too along with the different anemone fish. The bigger fish seen here are bumphead parrotfish and black tip reef shark. The depth and location make the Coral Garden a very good and popular night dive on which you may see Spanish Dancers and flashlight fish. This site, an old lava flow from Mount Agung, is at the opposite end of the bay to the Liberty wreck (about a 10 minute walk along the stony beach). The dive starts off on a steep sand slope with nudibranches, flounders, goby/shrimp sets. At 12 m are sponges with many varieties of shrimp, leaf scorpion fish abound and there are many crinoids, often with attendant ghost pipefish. Continuing round to the right, the slope develops into a reef with very impressive topography, becoming a vertical wall from 15m and descending to below 60m. Visibility - best in the morning - is usually 15-20 m (due to the amount of plankton in the water) and because of the location it is rare that there is a current, even a mild one. The wall has profuse sponges, corals, black coral bushes, gorgonian fans - at 30 m there's one that reaches 2 m in width that we visit for the deep dive on the Advanced Open Water course. The wall, the lava spur, then reverts to being a steep slope. The fish life is similar to that found on the wreck but being a much larger area, is less dense. However, more often than on the wreck you will see white tip and black tip reef sharks, large napoleon wrasse, big bumphead parrotfish, some big filefish (including scrawled), and large moray eel. Late afternoon is the time to see the wide variety of lionfish that live here. There have been sightings of Whale Shark in as little as 9 m of water and much deeper, hammerhead shark. The back reef at the top of the Wall, averaging 5 m, contains an excellent "aquarium section", including cuttlefish, octopus, boxer crabs and many other unexpected treasures, enabling you to finish your dive at around 5 m for pretty much as long as you want to. This is of course also very popular with snorkellers. "Lovely wall dive with the chance to see octopus, nudibranch, big school of fish, bump head parrot fish & our guide said he saw a 3 metre long whale shark the day after Christmas. " "Amed is close to Tulamben and same in Karangasem regency. Amed is a very good diving spot for Macro and Muck diving." Amuk Bay, with Padangbai to the south and Candidasa to the north, is about 6 km across and located along the south side of Bali's eastern point. Just north of Padangbai is Blue Lagoon. Tepekong and Mimpang are islands outside the bay. Biaha is a little to the north and Gili Selang is off Bali's northeast tip. All offer some of the most breath-taking diving in Bali (detailed below). Due to conditions though these sites need to be treated with care and respect. The currents coming from the Lombok Strait create unpredictable water movements that can result in a washing machine effect. Mimpang, Tepekong and Biaha are all surrounded by remarkably healthy reefs, but they are generally low-lying due to the (at times) torrential current that sweeps the east coast of Bali. This current brings nutrients to these reef and accounts for the diversity of their marine life. You will find a vast number and great diversity of fish, abundant sharks and frequent pelagic visitors set against a dramatic backdrop of craggy black walls with beautiful, healthy corals and often superb visibility. The water can be cold, although it is precisely this that makes these sites what they are: the deep basin 100 km south of Bali from which upwells extremely cold water to replace that taken away by currents to the west of Bali. This upwelling brings with it some of the marine life for which this area is famous (schooling pelagics, mola mola). Blue Lagoon is actually a small bay with a steep white sand beach, located just northeast of Padangbai. The steepness of the beach means there are waves which means a 5 minute jukung (outrigger boat) ride from Padangbai. The topography is not spectacular: white sand bottom, which slopes gradually to 22 m, has scattered rocks, soft corals and a huge area of staghorn coral. The fish life however is amazing! A large napoleon wrasse lives here, as do several kinds of unusual reef shark, stonefish, moray and blue ribbon eels, nudibranches, rays, squid and octopus, leaf scorpion fish in every hue and stargazers. While the diving at Blue Lagoon is easy experienced divers and photographers also thoroughly enjoy the site. Visibility is 15-20 m, there is sometimes a little surge and a mild current, but the bay is fairly protected. The site has a good variety of sweetlips, angelfish and surgeonfish. "Blue lagoon and Tulamben are the 2 diving sites that I know from Bali. They were just amazing, fantastic wealth and diversity of fishes, coral and plants. All of that very far away from all the touristice places which is an absolute advantage in Bali. Just great people and sceneries to see on top of diving. I would recommend travelling there even when not on Honeymoon! I did my first dives and got my Open Water. I think I was very lucky to do pretty much all my dives in two fantastic diving sites : Blue lagoon around Padangbai - then of course in Tulamben ( near the ship wreck). For a non experienced divers those dives are just amazing - you see so much even a 10 m, it is unbelievable and clearly a big hook and incentive to carry on diving. " Tepekong is a 300 m long rock which offers some of the most spectacular diving in Bali. However, steep walls, the canyon, cold water and strong currents make this a site for experienced divers only. Drifting with the current you can see sharks, moray eel, rays and big pelagics. Visibility is usually very good. If conditions are not suitable, there are other good sites in the vicinity. The Canyon is located off the very south-western tip of Tepekong, max depth 40 m. Entering on the steep slope just slightly north of the Canyon itself, you head straight down to 25 m and enter The Canyon. If there is no current (a very rare occurrence), you will be able to clearly see the dramatic beauty of these stunning, craggy black stone walls. If there is the usual swirling current, you can still see and feel the drama of the site, but your view will be somewhat obstructed by the huge schools of sweetlips, snapper and big-eyed trevally, bumphead parrotfish, unicorn fish, batfish, groupers, sharks (usually white tip reef sharks) and other pelagics - which may include tuna and mola mola (the enormous oceanic sunfish which can weigh two tonnes) in season (September to October). These waters are rich with nutrients that attract smaller fish - damsels, basslets and anthias - and therefore larger fish too! The Canyon has some soft corals and small gorgonians. Mimpang is an island outside Amuk Bay. At 12 m you see a small coral reef, white sand and a small wall, maximum depth 30 m. Look out for trumpet fish and during the season (August-September) mola mola (oceanic sunfish). The current can be up and down and sometimes strong surge as you enter. Also known as Batu Tiga ("Three Rocks") Mimpang is exactly that: three large rocks that break the surface and several others below, which run in a ridge: to the north towards Bali and to the south (the richer end) dropping into deeper water. Although Mimpang is only 1 km from Tepekong the conditions at the two sites are regularly different. Therefore if you cannot dive at Mimpang and go to Tepekong instead, you may well be able to do your second dive at Mimpang. Mimpang's Shark Point offers a better chance to see white tip reef shark than Tepekong does, and often in great numbers. This is where you have the best chance of seeing sharks in Bali. The current here can be strong, but is fairly predictable. The topography of Mimpang is diverse, with sloping reefs, craggy rocks and walls - all with hard and soft corals and some gorgonians. 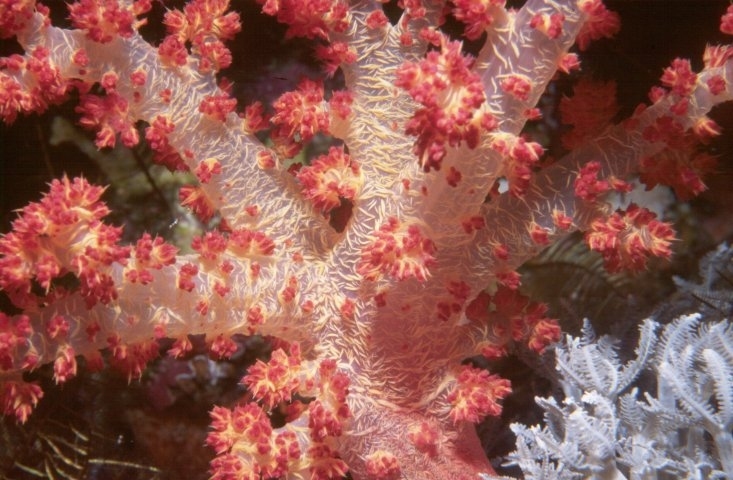 The reef has a good cover of soft corals, with many stony corals, staghorn and table corals. There are big schools of unicorn fish and snapper, many blue-spotted rays, napoleon wrasse, moray eels, trumpet fish, banner fish, butterfly fish, triggerfish and trevally as well as the innumerable reef fish. In places you can find large gorgonians and barrel sponges. This rock is shaped like a banana and is about 4 km from Mimpang and Tepekong. The current here can be very strong, not only horizontally but also upwards and downwards. Most of the awkward currents are on the northern slope. The surge also can be very strong. There is a beautiful and healthy reef around the island, a rocky slope in the north and a wall around the southern part. This rugged black wall, with the breaking waves above, is absolutely beautiful in places and at times it is almost as if the fish are superfluous - but not quite! There are various entry points around the island, and your dive can cover almost the entire circumference of the island or just a small part, it depends on your interests and also, of course, the currents and conditions! A small island lying off Bali's eastern point which, like all exposed sites, at times has ripping currents. The interesting and rich sand slope to the north of the island has some stands of hard branching corals and occasional bommies, the deeper areas of the slope are more protected and therefore home to sea fans, soft corals, barrel sponges and coral bushes. Along this sand slope you may well see white tip reef shark and bumphead parrotfish. Swimming at about 18 m, moving southwards with the current around the east side of Gili Selang, can provide you with great visibility. Here however, the slope becomes rockier, much steeper and loses any significant coral cover. Tucking into the south side of the island and coming in towards Bali, you will get out of the current, and encounter another area of low but healthy reef with many moray eels and schooling fish including trevally. Dotted around are bommies and leather corals. A wall dive. Entering from the boat you drop down to 14 m along a small coral reef on the slope. To the right runs a wall (depth over 40 m), to the left the small coral reef continues, with hard, soft and table corals, (maximum depth 24 m). The marine life is excellent with the occasional turtle, tuna, parrotfish, barracuda, angelfish, scorpion fish, butterfly fish, sweetlips and many kinds of triggerfish. Conditions are generally easier here than at The Canyon but you can still expect to encounter surge and sometimes strong down currents. On the gentle slope at northeast Tepekong is a small, shallow (10 m), semi-protected, rocky reef with bommies. This is a reasonably sized island off the south east coast of Bali. The water here is colder because of the ocean currents. Penida is the largest of three islands which include Lembongan (one dive site, Blue Corner) and Ceningan (no dive sites). All diving is boat and drift diving. Nusa Penida has several dive sites, three of which are joined—you can go in at Sental and drift along until you come to PED where you exit, change tanks, have a surface interval and go back into the water where you just exited, drift along to SD where you exit, out, back in at the same point. However, you often cannot do all three sites because of conditions and changing currents. Sandy bottom at 15 m with soft corals, surge, and sometimes strong current (horizontal). When the current is strong the fish are few. Wall diving. There is a Bat Cave: enter from underwater, surface inside the cave which is open to the sky - big waves may crash in through the top. Obviously there are bats in the cave. 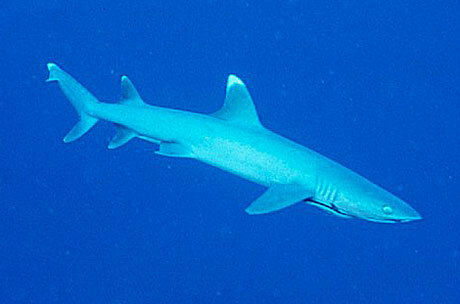 Sometimes two small reef shark are in the cave, but they leave when you arrive. Continuing along the wall from the Bat Cave, very deep, the wall has hard corals and a lot of lobster. "Very good visibility and the chance to see mola mola. Slight current but nothing too serious." Wall and slope diving, going with the current, to depths between 5 and 25 m. Currents are usually strong and the vis excellent (18-30 m). It is very easy to find big ocean-going fish because of the currents, including manta ray, white tip and black tip shark, tuna and barracuda. SD stands for Skola Desar, the junior school. "SD: Wall with thousand of small fish as nursery and big fish on the blue side! " A reef starting at 14 m, usually with the current going to the left. It slopes down to 25 m, where the current usually goes to the right. When these two currents are strong, because they are going in different directions it can be dangerous (washing machine effect). Look out for Jackfish, Scorpionfish, Moray Eel, Napoleon Wrasse, turtles and Sunfish (Mola Mola) in season (August to September). "Pristine corals soft and hard with more than 20 meters visibility in warm and crystal water! " Off Nusa Penida's south-west point, comprises a sandy bottom at 12-18 m. This is where Manta come in to feed, there is no guarantee you will see them but it is pretty likely. This area has a small current but sometimes strong surge. The manta are 2-4 m wide (totally harmless, they eat plankton). The water is cooler than other places in Bali because it comes in from the ocean (22-26 oC). 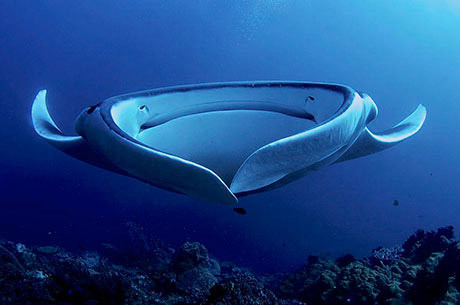 "Incredible dive site with cleaning station that allowed to see Manta rays all year around. " "Straight forward dive with a bit of surge. Just hover at 10m and watch the manta rays circle for an hour! " "Manta point is one of the favorite dive side in Bali. Beside that you can see Mola-Mola the giant fish on july-october season. " 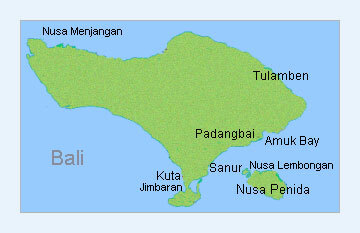 Nusa Lembongan is a long thin island off Nusa Penida's north-west corner. "Nusa Lembongan is a small island off the coast of Bali... worldwide famous for seaweed cultivation... thus perfectly kept environment with beautifully healthy corals (both hard and soft) and interesting drift dives over hundreds of metres of vegetation. " Off the boat to a slope starting at 10 m, very popular drift diving (strong, sometimes downward). The slope has soft corals, pufferfish, boxfish. There is indeed a corner, a vertical wall, and at this corner, the depth is around 28 m. During the season Mola Mola (Sunfish). Other fish include shark, very big Napoleon Wrasse and Eagle Ray. The corner is usually full of fish. A wreck lying between 7 and 20 m.
"I love Bali. The diving is great, but the prices are not as good as other places in the world. I'm an independent diver travelling with my son who is also a diver. I'm an instructor and my son is a Master Scuba Diver. In most places we dive without a guide. Talking with the people at dive shops or looking at dive guide books will give more than enough information. However, some places with strong currents are recommended only with a guide who knows the area. My favorite area to dive is Jemeluk Bay. There are two dive sites. It's about 20 minutes south of Tulamben. Walk off the beach and swim to the left or the right and go diving. Great wall down to about 40 m."
A small island five miles north-west of Bali. Menjangan is Indonesian for deer. Part of West Bali National Park, it is renowned for easy wall-diving. Look out for pygmy seahorses. Not the place to see large pelagic fish. Warm water with good visibility where you can dive all year round. "We stayed at the Mimpi Resort Menjangan for the last week of our 4-weeks tour trough Bali and Lombok. Menjangan Is a magical place. The resort lays in the middle of the Barat National Park with a lot of attention to the smallest details. It's just agreat place to enjoy nature and spend time with your loved one. The resort has various natural hot springs and you can watch the monkeys search for food while chilling in the hot waters of the springs. The dive center is small and the staff are very attentive making your stay as comfortable as it can be. Being an instructor myself, I have never seen a place elsewhere where I had so much fun being underwater. It's a stunning place with very small dive groups and very service oriented dive guides." "Menjangan Island and the nearby mainland are excellent places for swimming, snorkeling and scuba diving. Comprising hundreds of species of coral, these reefs extend 100 to 150m from the shore then drop 40 to 60 m down to ocean floor." "Outstanding wall dives, rich diversity of critters, lush coral gardens." "We took our teenage boys to Menjangan for some snorkeling. We stayed at the Mimpi Resort and booked the morning excursion from the dive shop at the hotel. As it is a long drive from the main tourist spots there were few people there. We snorkelled on both sides of Menjangan island and found it a beautiful spot with a carpet of beautiful coral and plenty of fish. 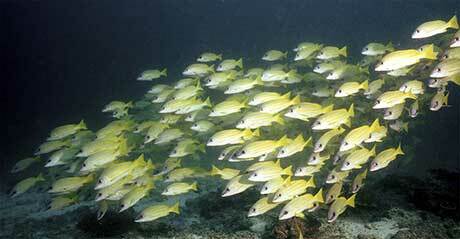 On the south side of the island there is a wall with various small schools of fish swimming along it. An easy snorkle and good for kids." "Really nice and eerie.... Just myself and the dive guide. Really tranquil. " "Macro but not muck. Our guide showed us harliquin shrimp and the coleman shrimp. Amazing nudis, frogfish and other small things. " "True muck site. No corals but plenty of weird rare critters. We saw mimic octopus by day and coconut octopus by night. Also frogfish, ambon scorpion fish , sea moths, seahorse and ghost pipefish ect. " 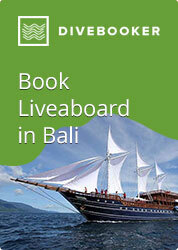 Diving Bali Lovely e-book from Vilondo Villas, and it's free! Have you dived in Bali? Let us know about the dive sites, accommodation , dive centre and anything else you feel like mentioning. Either fill in the form below or see our more detailed recommendations form.